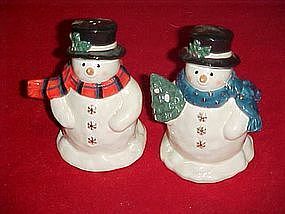 These nice snowman salt and pepper shakers match the musical snowman cookie jar I have listed. They are made of hand painted highly glazed ceramic. They have gold snowflakes for buttons. They have the original plastic stoppers and measure 4 1/4" tall. Pristine condition.